Niagara on the Lake offers a multitude of dining experiences, from the very casual family dining to gourmet fare. Within a two minute walk are several casual restaurants that offer informal food in a pleasing setting. Our guest service staff would be delighted to offer recommendations based on your needs and to make reservations for you. Butler's Bar & Grill is known for their amazing pizza and wings and is a great spot to play pool or catch your favourite sport on TV. Open for lunch, dinner, and late-night. 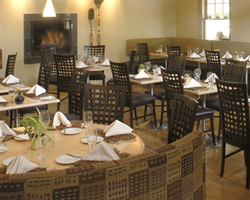 For a wonderful and special culinary experience, we recommend the HobNob Restaurant at the Charles hotel. The Charles is a historic 1832 mansion that offers fine dining on the verandas and patio, in the lounge, or their intimate dining room. 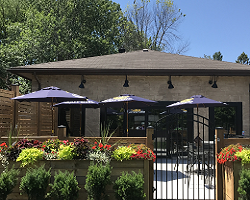 Further along the main street is Zees Grill which offers classic, nostalgic food served with a creative twist in a relaxing setting either on their patio, veranda, or dining room. "They advertise having the best wings in town, and they're not kidding. Their fries and pizzas are great as well, but the best kept secret is the fantastic home-made soups. I'm pleased to call myself a 'regular'." "What a LOVELY place to dine. Our waitress was great and the food was SUPERB!! We will definitely be returning and making it a place to visit and dine." 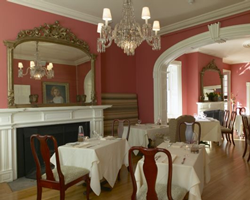 "This was by far my favourite restaurant I have been to in NOTL. We had a gorgeous table on the patio surrounded by flowers. The food was delicious - they had me at lobster poutine and I was in love by the time I finished my nori-wrapped Ahi tuna. The service was impeccable."